Start a new Ariel Atom question. 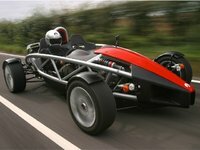 What Do You Think Of The 2009 Ariel Atom? Most cars prefer to hide their frame behind smooth, curved sheets of steel and surround the driver with a metal roof and a glass windshield and windows. But then, most cars can't get from a standstill up to 100 mph and back to a stop in less than 12 seconds. 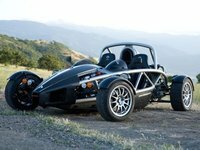 The Ariel Atom dares to be different. From the beginning, the Atom has worn its skeleton on the outside, had an entirely open cockpit with no windshield (though it now offers optional windscreens), and astonished drivers with its speed and handling. 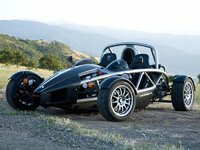 The Atom has been outfitted with a number of different engines, the most powerful of which are a 220-280-hp supercharged Honda four-cylinder VTEC (used in the U.K.) and a 300-hp GM Ecotec V8 (used in the U.S.). The Atom has won Autocar's 0-100-0 challenge three times, most recently on August 30, 2008, in 11.5 seconds. The Atom's strengths are its acceleration and handling. It tops out at about 140 mph, which isn't terribly impressive within its class, but it can also get from 0 to 60 in less than 3 seconds. Its suspension features two double unequal length wishbones and hand-adjustable dampers for the suspension, springs, and wheel camber that result in race-car accurate and adjustable handling. The Atom's certainly not for everyone, but it will serve as a perfect track car for some. And while its $65,000 U.S. base price isn't cheap, it's a lot less than that of many of the cars it consistently outperforms.